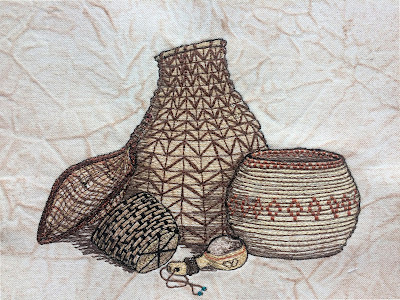 Basket weaving is one of the oldest known art forms. Nearly every native people, dating back thousands of years, used a variety of organic materials to weave baskets, mats, even rafts. I had a chance to make a basket a few years ago when a friend of our daughter visited while we were visiting. She brought all the supplies and patiently instructed while everyone participated. It was great fun, but not an art form I could easily do living in a condominium. The idea to thread-sketch woven baskets was sparked while working on the stitched interpretations of the F. Abel paintings. The basket weave seemed perfect for thread sketching. Shapes and designs would be limited only by the imagination, and as complex or simple as you like. 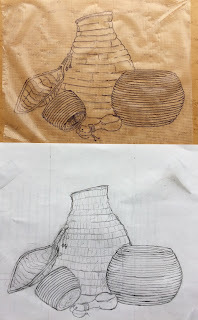 I completed four sketches. Three of the sketches will be framed or used as cards. One of the baskets turned into a learning experience. 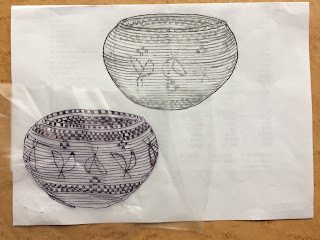 Because I am unfamiliar with "basket weaver" terminology, I have included many pictures to help explain what worked for me and what did not. 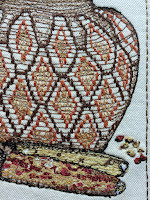 Because the free-motion stitches are almost impossible to remove, mistakes need to be worked into the final design. 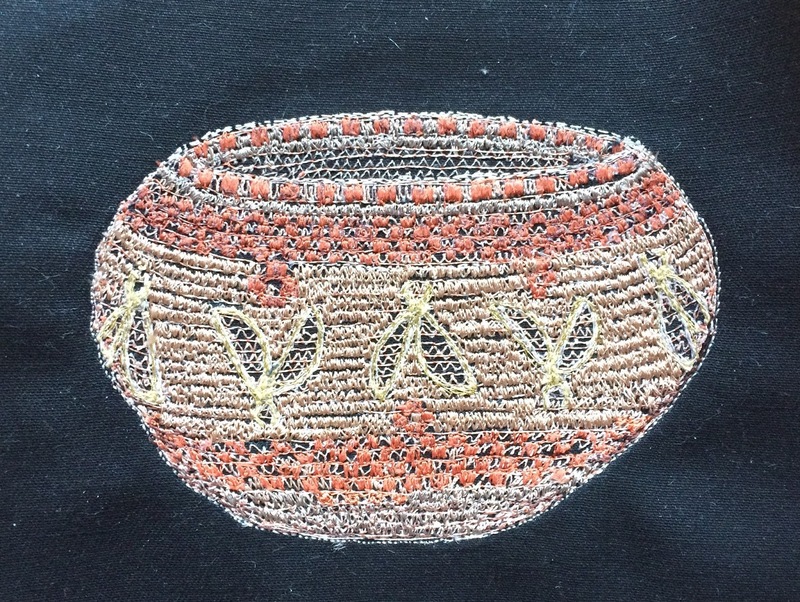 This first basket looks quite different than I originally intended. 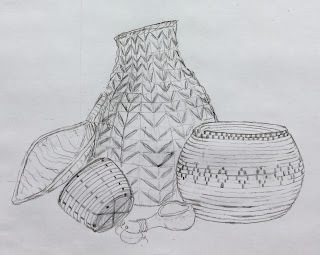 The initial pencil sketch featured simple patterns around the body and the neck. 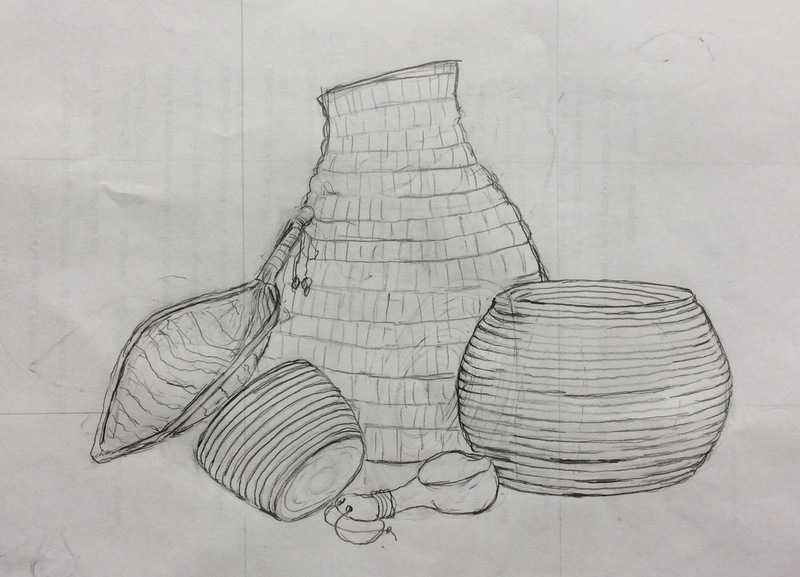 It is important that the horizontal "reeds" of the basket be drawn evenly across the basket. 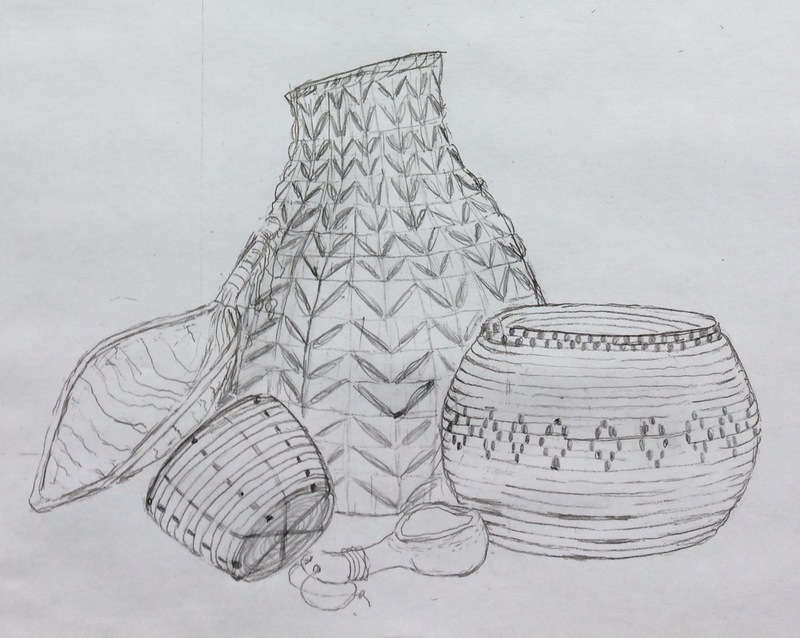 This picture shows the lines in the neck of the basket were not evenly spaced creating an unintentional feature. 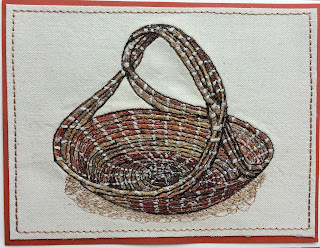 I first set my machine to a zig-zag stitch and used free motion to create the decorative features of the basket. 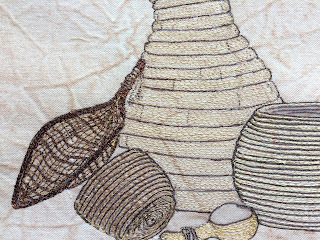 Because my reed lines were uneven, it was easier to use straight stitch setting and move the fabric back and forth to create the woven look. Design elements were added and changed as I went. 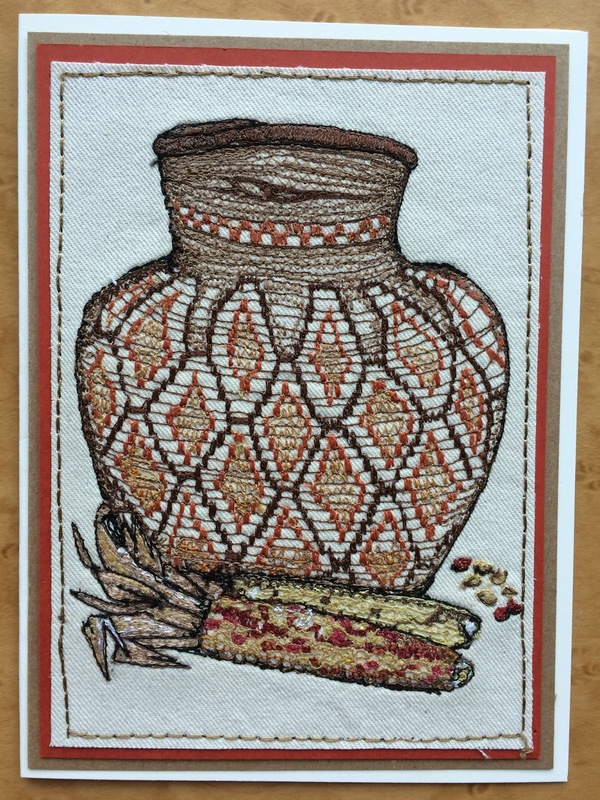 The uneven lines in the basket neck became a featured flaw. Loose zig-zag stitches were added to the neck. I was satisfied enough with this first attempt to try a few more baskets. Normally, tracing the design to the stabilizer is a quick step, transferring only a few lines as a guide. 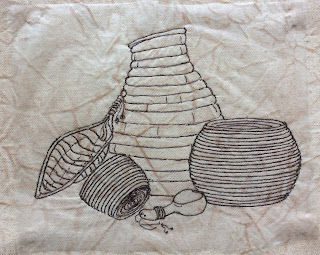 Taking care to create even lines across the basket made it more time consuming. 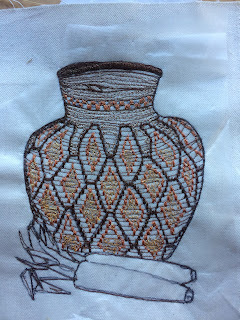 My confidence was high, so I tried a bit more difficult decorative pattern. You may recognize the insect wings as my logo. I started with black twill fabric as the canvas. 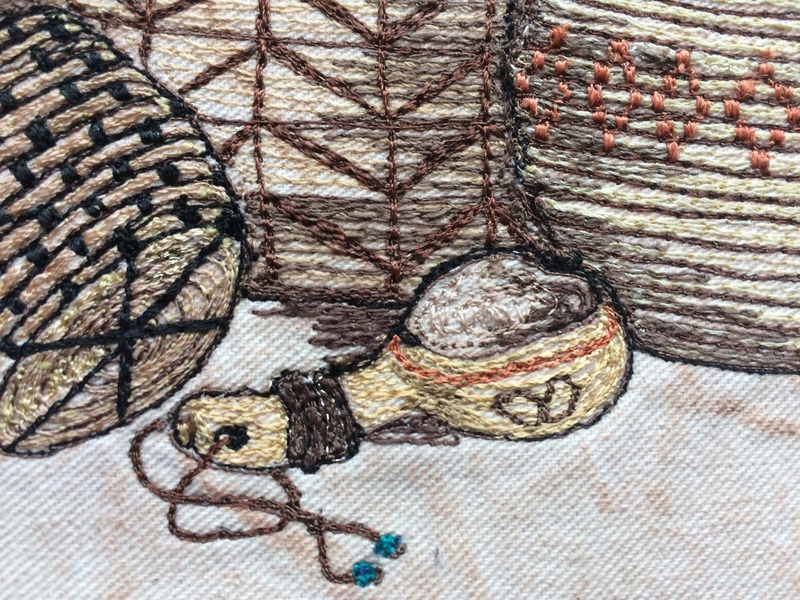 I thought I could stitch the reeds and the black fabric would create shadows and definition. 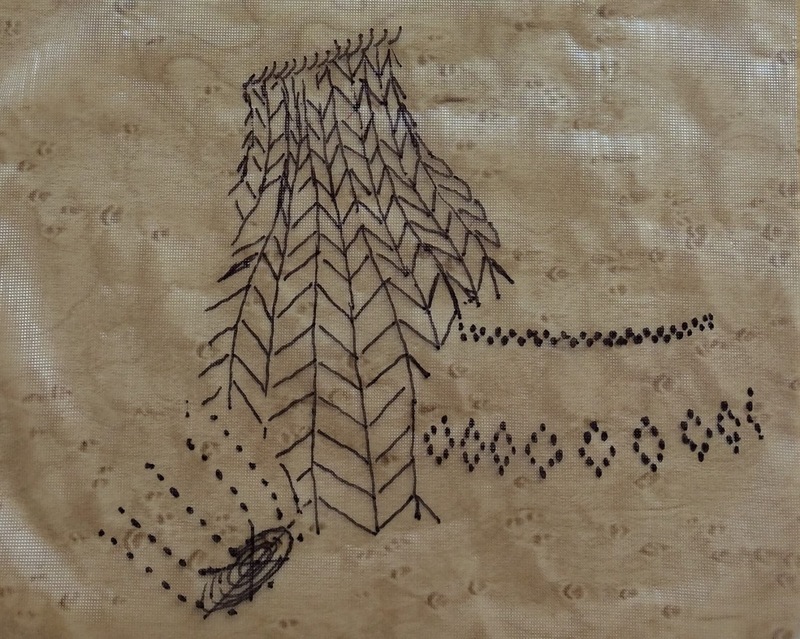 I set my machine to zig-zag stitch and used free motion to stitch the rows. It did not work for me. 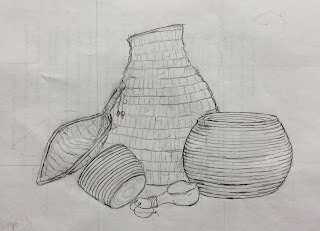 I lost the curve of the basket and it looks messy. At this point, I still had hope of saving it. 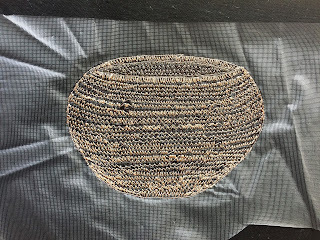 However, because the decorative pattern was no longer visible under the zig-zag stitches, I had to re-draw the pattern onto a second piece of stabilizer. egads! A bit of frustration and a mile of thread later, I decided it was a lost cause. 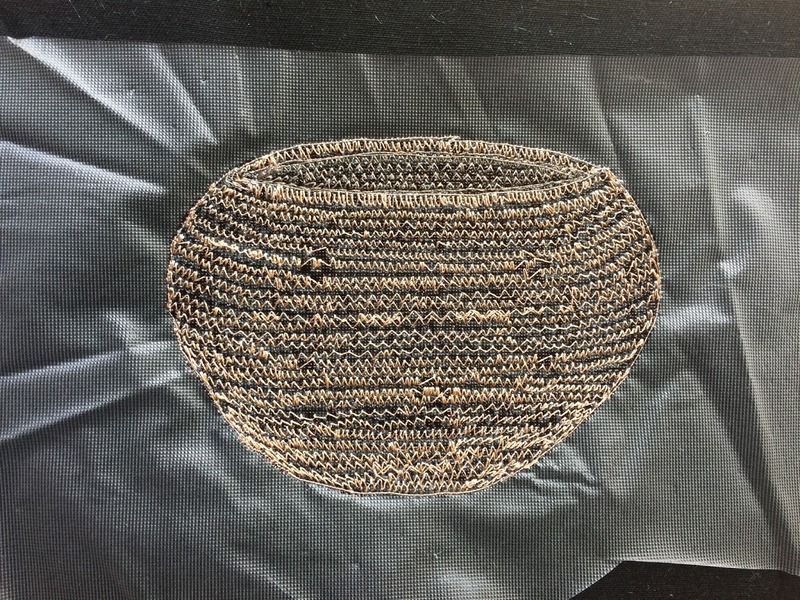 Perhaps more practice using the machine zig-zag stitch in free-motion. 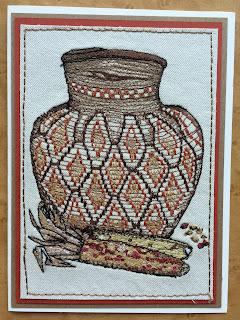 Not as confident after the last basket, I found a photo I could follow rather than making my own design. I traced the shapes and reed lines onto the stabilizer. 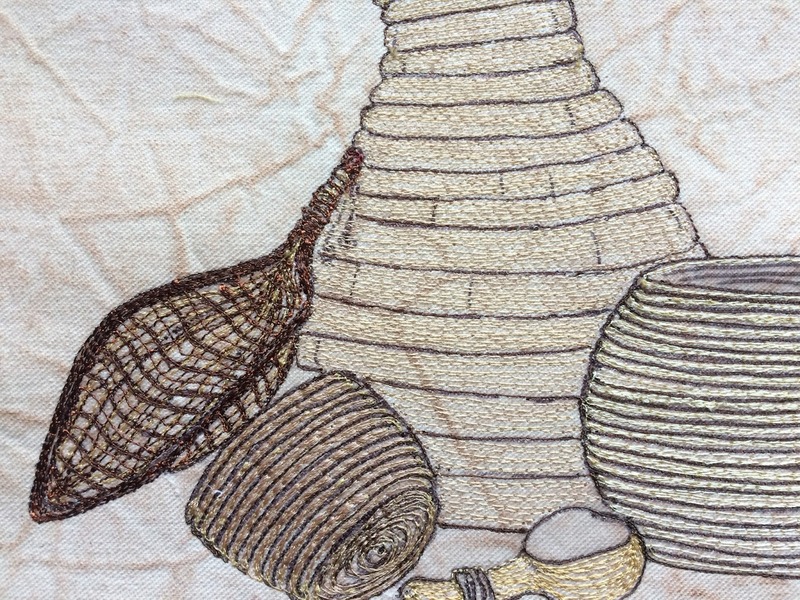 I used free-motion with a straight stitch to create the reeds. 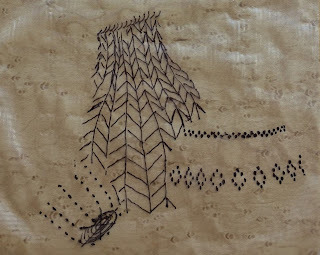 The white spokes, or perhaps they are called lashing, were stitched next. 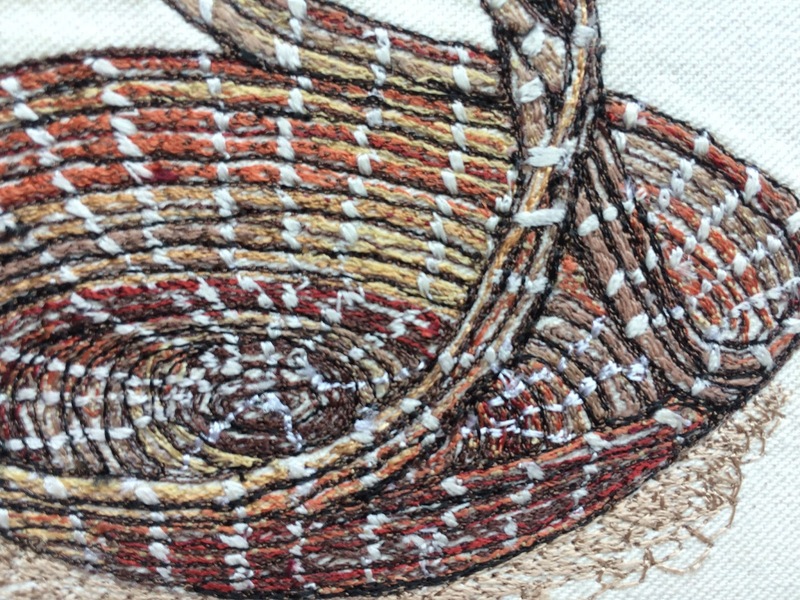 They are long back-and-forth free motion stitches. 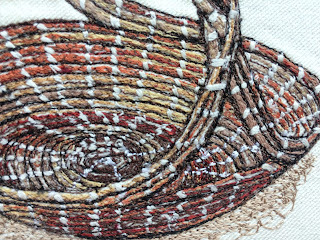 The final black stitching added definition and dimension to each row of the basket. 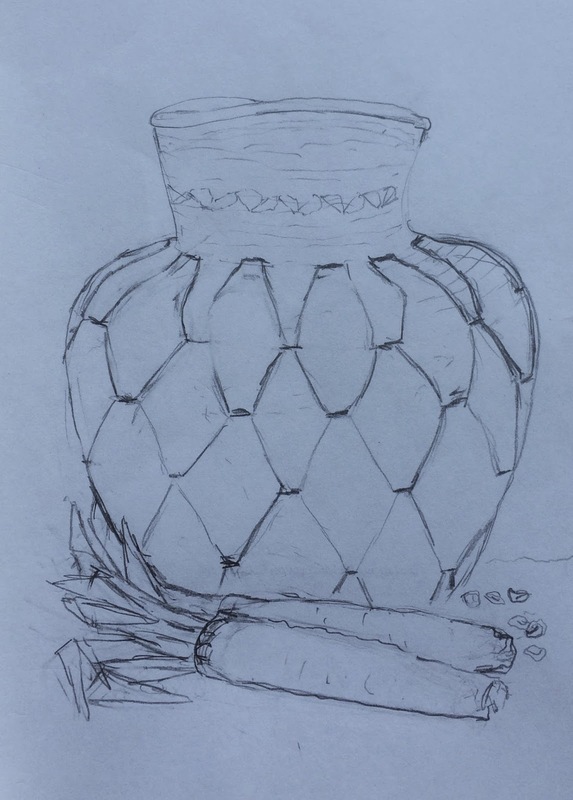 I do not have a trained eye for composition, so started with a pencil sketch and a very large eraser. Looking closely, you can see remnants of a lid leaning against the basket on the right. The lid created a busy feel with too many lines. 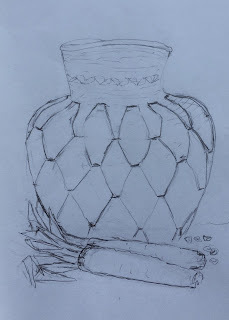 The eraser took care of the lid and the gourd ladle was added in its place. 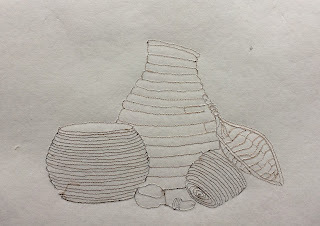 The pencil sketch and first layer of water soluble stabilizer with basic shapes and reed lines. Before applying the layers of stabilizer, I treated the fabric by dampening it with a bit of water and scrunching to create wrinkles. I gently straightened the fabric and while still damp, used acrylic paints and a dry-brush technique to highlight the wrinkles. I ironed the fabric removing as many wrinkles as possible. Once dry, I used an adhesive tear-away and a second layer of tear-away stabilizer on the back. Make sure your fabric is completely dry before layering the water-soluble stabilizer on top! The traced picture will dissolve with any moisture! 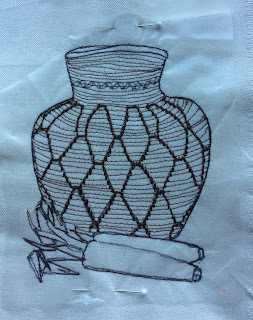 It is hard to see, but the basic shapes are stitched. 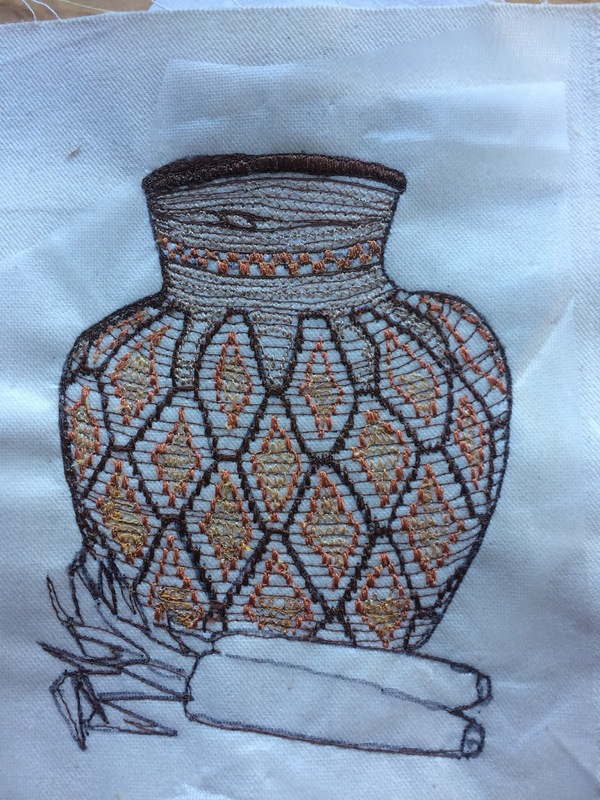 The reed lines were filled using free-motion and straight stitch setting. To create the decorative designs, I photocopied the original sketch and played with patterns on the copy until I found a combination that appealed to me. Using the copy allowed me to audition and erase without erasing my original lines. Just the decorative elements on the stabilizer. Precision is key. 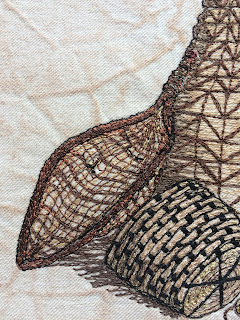 If your stabilizer stretches or your stitches have puckered the canvas, the second layer of stabilizer will not align with what you have already stitched. A few shadows were added to the baskets before proceeding to the decorative stitches. 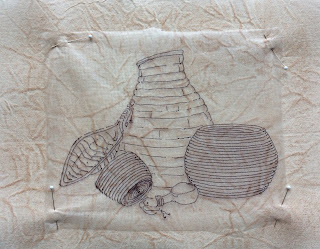 Now, it is time to layer the second piece of water soluble stabilizer over the stitched basket shapes. Using tape rather than pins to hold stabilizer in place made it easier to match all the lines. 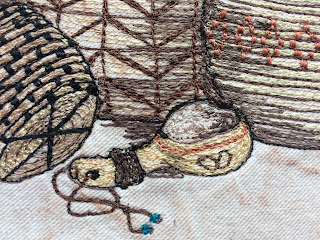 The stitch patterns can be seen in these close-up photos. 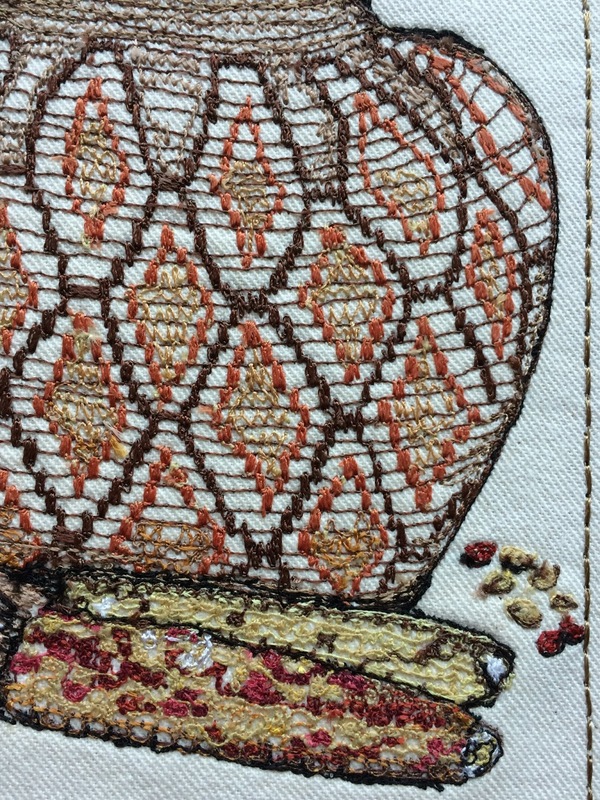 All stitches were free-motion on straight stitch setting. 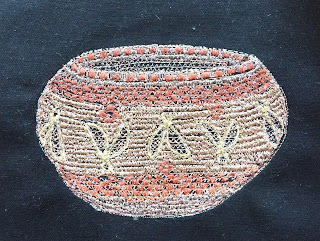 The black pattern lines on the small basket, and the rust colored pattern on the medium basket were created like satin stitches, moving the fabric back and forth multiple times with the needle inserting directly on the horizontal lines of the basket. It takes a little practice, but does not need to be perfect to produce satisfying results. I found that the free-motion satin-stitch type sewing requires same or similar color thread in the bobbin. Pulling the thread across the fabric exposes some of the bobbin thread. I like that look for some projects, but it was not something I wanted for this picture. Re-stitching the horizontal lines with a dark color created contrast and draws the eye away from any errant needle entry points. 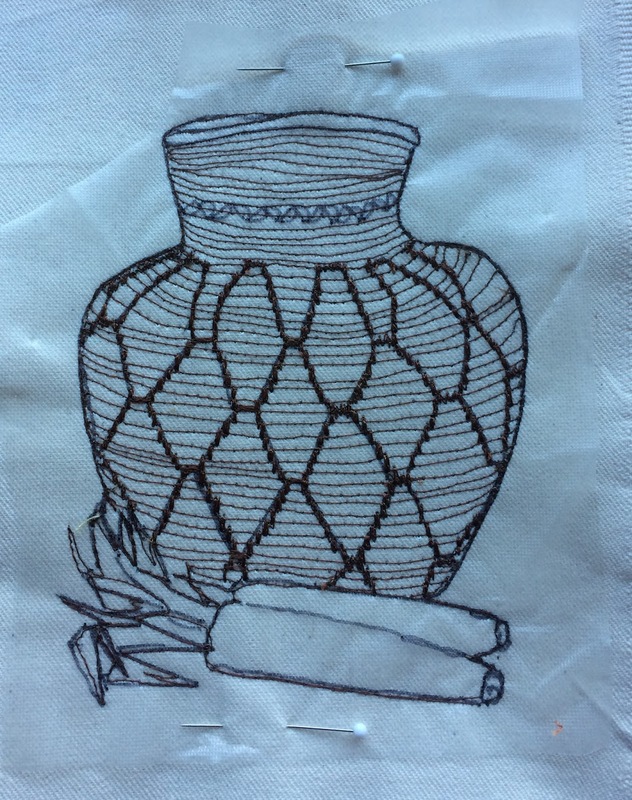 The basket thread sketches are time-consuming and a little tedious. It feels somewhat therapeutic, like,,,, well,,,,, like basket weaving! 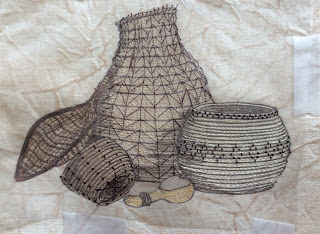 I think there is a more fun, and therapy, to be had with thread sketching baskets. 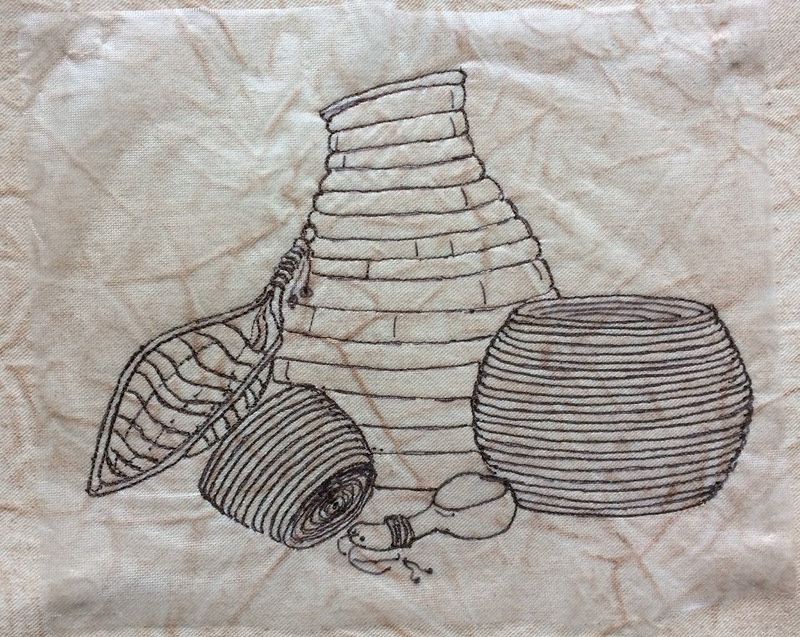 Watch my Urban Stitcher Facebook page for more thread-sketched baskets.